Here’s a great article written by our friends at Nourish Melbourne. 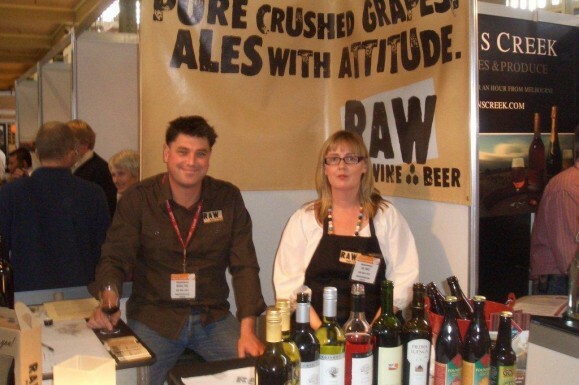 We spoke with Michael Gow, Director of RAW Wine and Beer, an independant organic wine and beer distribution company about the benefits of organic and preservative free wines (plus a bit about beer! ), and why they’re the more nourishing choice for you. NM: Please tell us about your passion and mission behind starting RAW Wine and Beer. MG: I started Raw wine and beer back in July 2002, I was working for another wholesaler at the time and they had an organic wine brand on the portfolio which I thought was very good wine.? ?I started looking into the Organic wine movement and had discovered some amazing wines, and my wife did get hot rashes and flushes on her skin, so I knew I was onto a good thing. ?The people who I have met in the last 10 plus years in the organic wine industry have truly been some of the most inspiring people I have meet in my life. NM: So what is it that makes organic wine and beer a better choice than a non-organic wine/beer? MG: The choice is easy, do you want to drink something with about 10 different chemicals in it, or a glass of wine that is a pure and expresses the place where it was grown? NM: What can you tell our readers that will really make them think twice about whether choosing organic or not, the next time they’re out buying wine/beer? MG: Organic wine won’t give you a hangover. Most hangovers are in the second bottle. NM: Can you tell us about any restaurants in Melbourne where we can find organic/preservative free wines on their wine lists? MG: We distribute many wines to a lot of vegetarian restaurants in Melbourne as our wines are vegan friendly, so they sit well in these restaurants. Some on the list include the Veggie Bar in Fitzroy, Shakahari in Carlton and Earthly Pleasures in Belgrave.? ?We’re also distributors to a lot of wine bars that want to give organic/preservative free wines a push and they include Deco wine bar in North Fitzroy, Presse Wine Bar in Elwood and Dogs Bar in St Kilda. NM: Beers – can you recommend some organic and perhaps gluten free brands that you stock? MG: Have to plug Mountain Goat Organic Steam Ale, I have been involved with Mt Goat since 1998. For the gluten-free crowd there is Wilde Gluten Free Pale Ale – this actually tastes like a beer! NM: What is your favourite wine/beer of choice? MG: Give me a bottle of Pinot Noir any day, followed by a Shiraz.? ?With beer I tend to drink seasonally – stouts and dark ales in winter and pale ales in summer.? ?Coopers and Mountain Goat are always in the fridge at my place just in case. MG: If you are going to drink wine or any sort of booze you should drink something that is organic which is also good for the planet. NM: Best coffee in Melbourne?